Just lovely, Cassandra! You do me proud! Just a quick note on the strange weather we had today. Blustery and snowy to start. Then add in sleet and a shift in wind direction. Then more snow...followed by freezing rain. And just a few minutes ago there was thunder and hard rain. Who knows what morning will bring? Only Mother Nature...and she's not giving any hints. Facebook elation: Finally, after almost two years of trying, my Facebook account is now officially deleted. Yes, you read it right...not just deactivated...DELETED! It's a new feature for those of you who are also trying to delete your accounts. It takes two weeks for the account to be officially gone and you cannot go into the account during that time period or you will be reactivated. I know the trend is toward lots of social media--but I find my blog to be plenty social enough--but feel free to add more comments each post so we can feel even more social! So there you have it for Wednesday, February 29. Leap Day is almost over and then we are into March. of Green Thumb! Yochi D. of Israel sent me this photo of her quilt top. She made this in just a week and included wonderful embroidered details. Makes one think of spring! Thank you for sharing, and Great Job!!!! Tomorrow I'll share another version of this quilt. Wait til you see it! P.S. I'll say this tonight: Happy Leap Year Day! 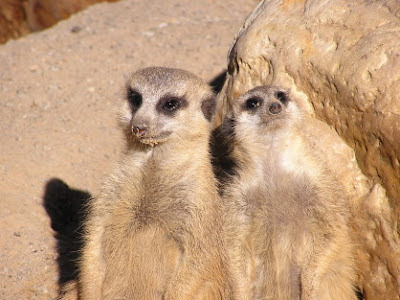 Do something extra fun on this extra day of 2012! P.P.S. For those working on Monthly Bliss 1, remember to smile! You know who I'm talking to! The wheels sometimes turn oh-so-slowly, but they still turn. The prizes for commenting on the 400th blog post are finally ready. These will be a limited edition--limited to just these eight; this combination of fabrics will not be used for this purpose again. 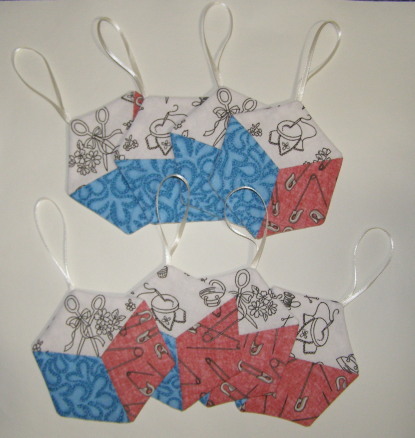 The tops are hand pieced and the ornaments are finished both by machine and hand. Each is signed and dated on the back. Which one will be yours? Even I don't know! I will address the envelopes, turn the ornaments face down and add one to each envelope! Luck of the draw. They will go in the mail on Monday. I hope you will enjoy them. Windy and cold here. Gusts up to 35 miles an hour, but I think they may be more than 35 mph. I have the Candy Cane sweater started again and am making good progress. 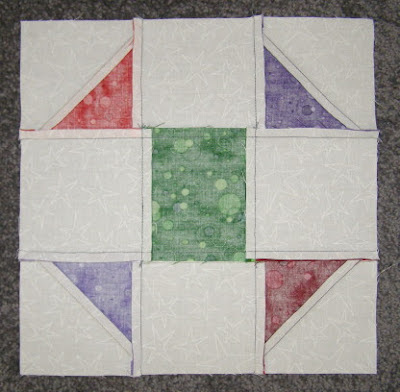 Have hand pieced three blocks from the new Monthly Bliss 3 sample. Finished the binding on a friend's tablerunner. A little of this and a little of that. That's it for tonight. Keep warm! P.S. I am listening to Comfort Food by Kate Jacobs. It's probably easiest to use a design wall to arrange the blocks. Arranging the blocks into a pleasing arrangement is half the fun! If you are using directional sashing strips (as in the frog fabric), you may want to lay in all the sashing and cornerstone pieces before proceeding. It may seem like a chore to do this part, but its a lot less tedious than frog stitching (aka Rip It Rip It)! Now let's set this top together! You will now form five sashing/block rows. Add a (vertical) sashing strip to the left side of each block, then join the blocks to form the row. 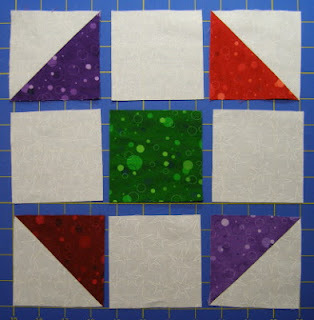 Add a sashing strip to the right side of the last block in the row. Press the seams toward the sashing (away from the blocks). Assemble the rows. I add a cornerstone/sashing row to the top and bottom of row 1. Press seams toward the cornerstone/sashing rows (away from the blocks). Add another sashing/block row. 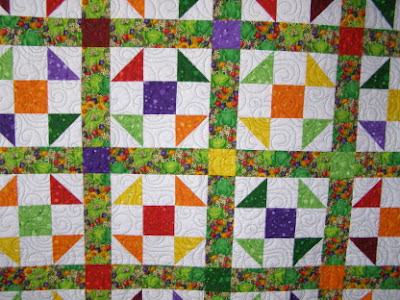 Press seams toward sashing row. Backstitch at the end of each seam as you assemble the rows. Continue adding rows until you have something that looks like this! Now that wasn't so bad, was it? Our decision was to have this machine quilted so that it could be loved and dragged and drooled on and then washed multiple times. 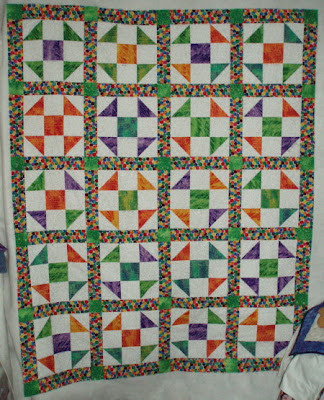 Yes, I do think hand quilting would stand up to that rigorous use, but it wouldn't have gotten to the grandma or baby by graduation time at the rate I am finishing things! It's important to choose your battles wisely. So there you have it! 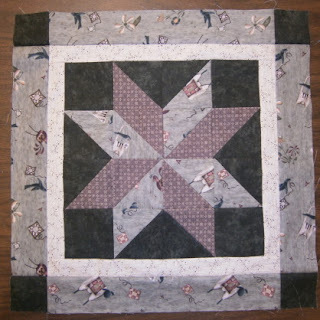 I have changed the name of the pattern posts to Shoo Fly Friendship Quilt and have made a pattern label on the left side bar so that you can more easily find it again. P.S. I am listening to War Horse by Michael Morpurgo. 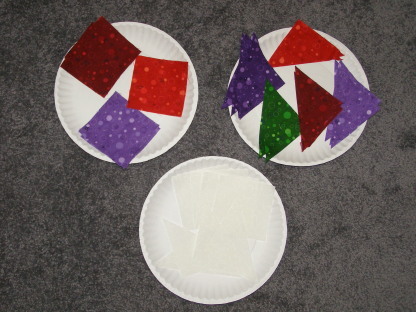 For each block, place five background squares and four half-square background triangles on a paper plate. Each person picks up one plate of background pieces and then chooses one design square and four half-square triangles and adds them to the plate. Some will choose five different design fabrics, some will choose five the same and some will fall somewhere in between. That's the fun of it! 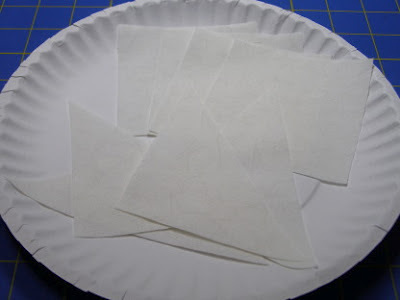 Set machines up for a scant 1/4 inch seam and use a neutral thread or match the darker colors. 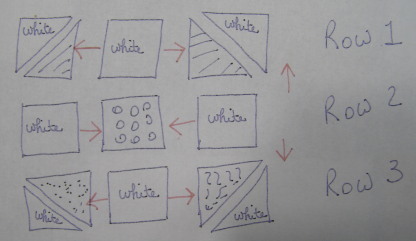 (Please do not use white, even if one of the fabrics is white; trust me on this.) 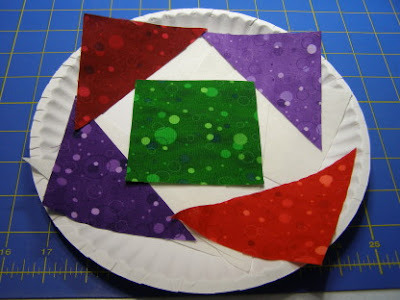 With right sides together, piece the half-square triangle units together. Set the seam and then press the seam toward the darker fabric. (Yes, I use steam.) Trim the dog-ears. Lay out the units as shown. Lay the completed rows back into the pattern. 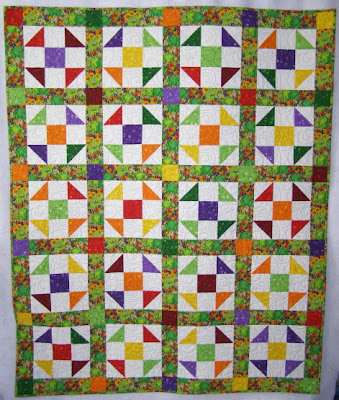 Fold Row 1 down over Row 2 and pin as shown. Be sure to match seams (they should be opposing). And the answer is: YES, you do need to pin to get those nice sharp points. As ye sew, so shall ye rip--just sayin'. Stitch and press the seam toward Row 1. See diagram above. Add Row 3 in the same manner and press toward Row 3. Here's the block from the back, all neatly pressed and measuring exactly 9-1/2 inches unfinished. And here's this beauty from the front. 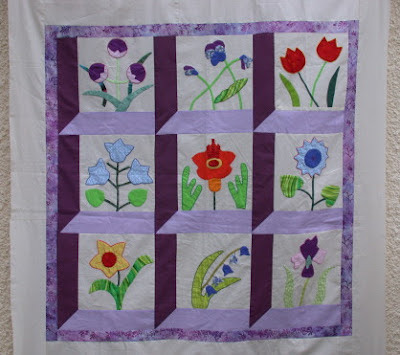 This block is easy enough to do with non-quilters, if they have some help. 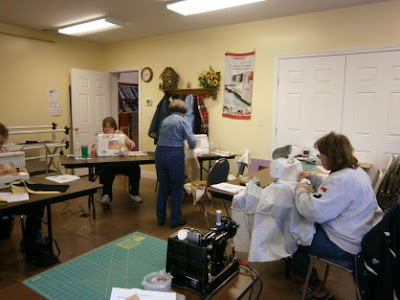 We pinned the units for the non-quilters and let them sew them with supervision. Advise them to sew slowly and not through their fingers! Have each person sign their block with permanent pen (I like Micron Pigma in a .03 or .05 point size). They can sign anywhere they want. Most of us signed on the white just under one of the design half-square triangles. (Before you think you've gone blind, this block is not signed!). See Part 2 for "Gramma's" signature block. 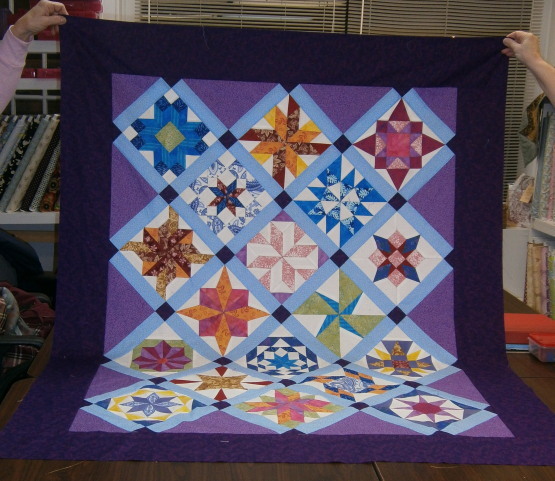 Julie commented on Part 2 of this serial blog post and, yes, it is Sam's quilt! We had a blast making it at Julie's baby shower. Tomorrow (or Monday) will be setting directions and then we are done with this project. Thanks for tuning in. P.S. 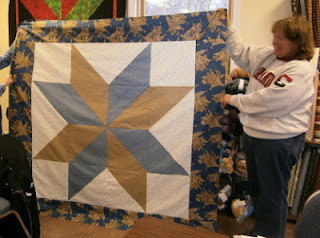 Jay, look under the "quilting" label on the left side of the blog and then for the December 4, 2011, post for the design wall story! Choosing fabrics can be done by one person or several. I do like to think about the recipient and the theme, if any, for the shower, etc. Usually the focus (sashing) fabric is chosen first and the supporting fabrics based on that. 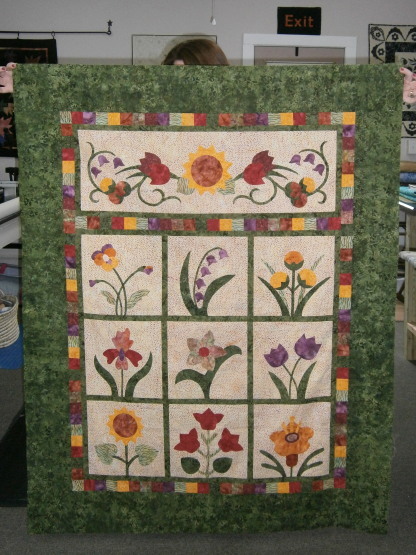 In Cindy's quilt, above, the frog fabric was first, then eight coordinating colors and the background. 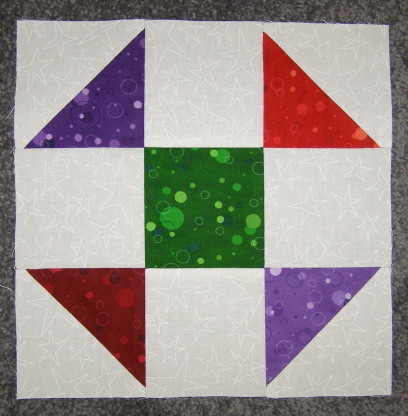 Or you could choose to do a more scrappy version with one background to unite the blocks and choose the sashing later. "Design" fabric: I bought fat quarters (8) and divided that number into the number of half square and square pieces I needed to cut. 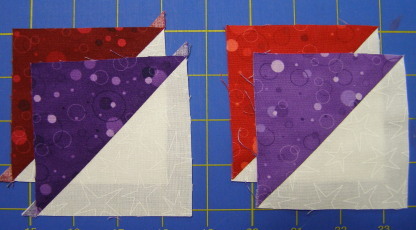 I had plenty left, so I cut the cornerstones from these fabrics as well. If you are doing everything from one fabric, a yard will more than suffice. You will need to cut a total of thirty (30) 3 inch squares for cornerstones from your chosen fabric. For sashing, you will need forty-nine (49) rectangles 3 x 9-1/2 inches. Remember to cut both lengthwise and crosswise if you have directional fabric (as happened with the frogs); non-directional fabrics I usually cut crosswise. I have been generous with yardage. I've never been a fan of getting almost to the end of a project and lacking just a bit of fabric. So I've already added for a safety factor. Tomorrow night? Piecing the blocks. 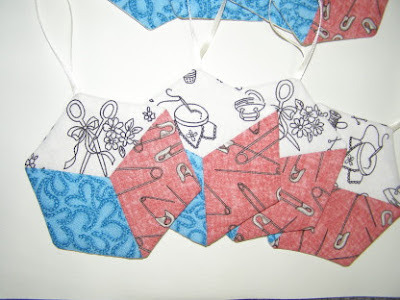 This is the first time I've put a pattern on the blog, so I welcome feedback and comments. Nine of us, including Cindy, met one evening and assembled the shoo fly blocks. Each person signed their blocks in Pigma pen. I took the blocks home and assembled them. A close-up. 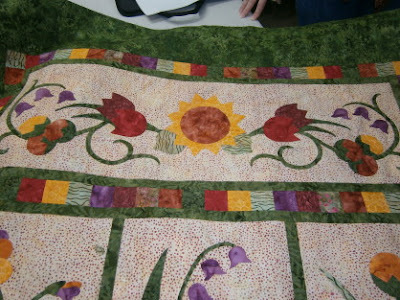 The machine quilting was done by our friend Debbie. 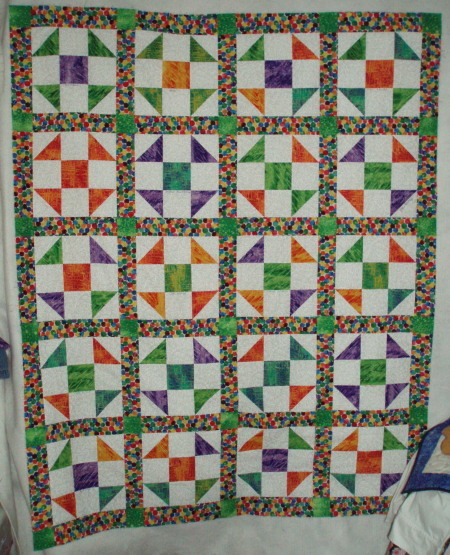 And this is a different quilt made using the same process. We did this at the mother's baby shower instead of games. Said baby is now walking and talking and growing like a weed! 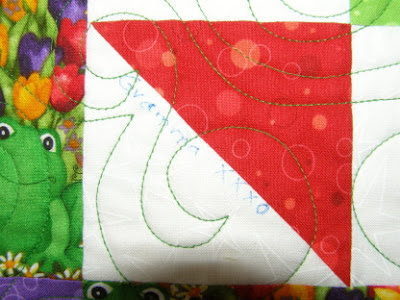 This was fabric from the Hungry Caterpillar line. And the surprise, you ask? Tomorrow (or Friday) I am going to share with you how to use this idea for your own party. We've used it for a baby shower, a gramma quilt...but wouldn't it also be great at a bridal shower? Or a birthday party (how about your own)? Graduation? You get the idea. So don't run off before you get the pattern. Ya'll come back now, hear? P.S. A correction: The Thimbleberries wreath in a prior post was incorrectly called Country Wreath. Its real name is Countryside Wreath. I've corrected it on that post, but wanted you to know in case you were looking for it! Sorry! P.P.S. When you compare the first and last pictures on this post you can see what a difference my new design wall hanging system has made in my pics. The story begins in July 2011. My BFF, Cindy, was about to become a first-time grandma, something she has always looked forward to. 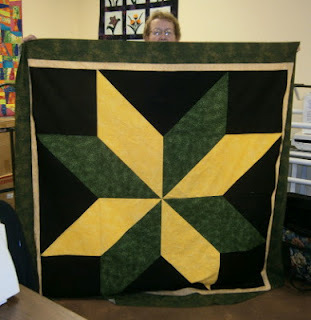 As quilters, you know this required something special. Stay tuned for part 2 tomorrow, and a surprise the day after. P.S. I am listening to "The Other Queen" by Philippa Gregory (about Mary, Queen of Scots). And I am reading "The Christmas Wedding" by James Patterson. At least two years ago I made the center for this wallhanging. I wasn't very thrilled with it for a variety of reasons and was ready to put it in the "don't like will never finish" pile. While contemplating its fate, it resided on my design wall. My mom went in one day to see what I was working on and just loved it! So, I added the borders and finished the top. 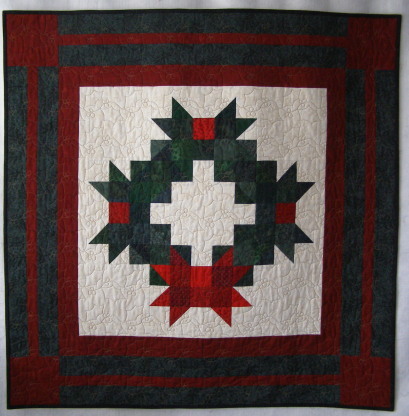 My friend Debbie longarm quilted it for me with tiny holly leaves and berries, which added texture and more interest. And guess what? I had no green fabric to bind it with! 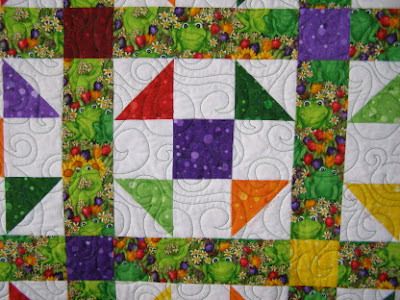 Many of these fabrics are vintage Thimbleberries. There were not even enough pieces to string together for binding. So...I carried it for almost two years looking for the perfect binding. No luck. I even begged friends and students to search their stashes. No luck. So...I decided I would carry it one more time to a quilt store (that was December 2011). If I didn't find something that day, black was the answer. Eureka! A blackish green with slightly lighter green that complemented the Thimbleberries green border. So, many moons after it was started, it is now finished. My mom still loves it and I can't wait for her to have it at her house. 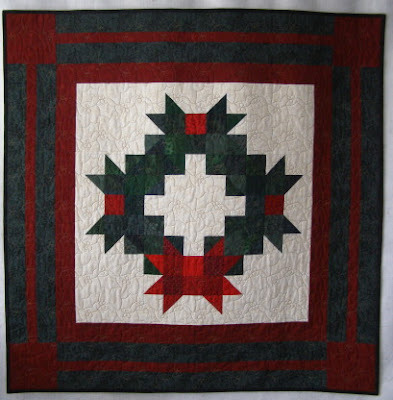 The pattern is Countryside Wreath by Thimbleberries. The wreath fabrics and reds were from my stash, the background was from my stash. All I had to buy was backing and...the elusive binding. P.S. Terrie from Canada: sharon@sharonstroud.com should work from anywhere. I have friends in Canada, England and Israel who use that. 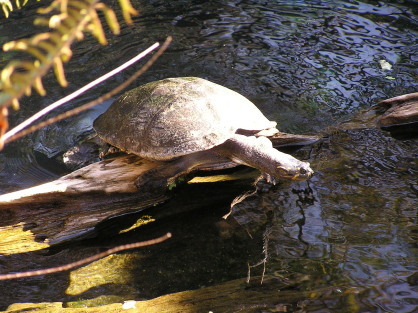 If you still have trouble, go to my website www.sharonstroud.com; there is an Email Sharon heading in the right column. Hit on that and it will take you to a message form. Little did these students know when they arrived for class on Saturday morning that they were helping me with gifts for Christmas 2012. Here are some of them in the sweatshop classroom, hard at work. The best trick? They all brought their own fabric! Check out Phyllis! Black always makes a stunning background. Susan got her center done, using civil war fabrics. 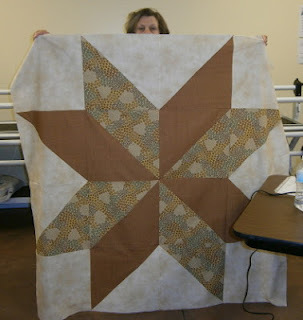 Judy D. had her center together, to be bordered with a dark brown and then the background fabric again. I think the print looks like an overhead view of a garden. 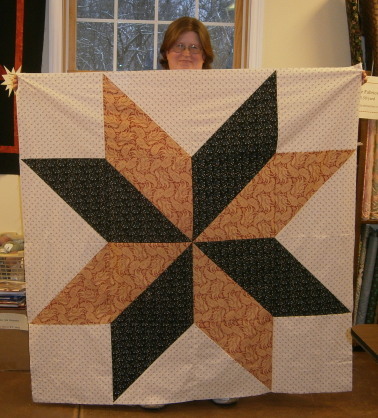 And Gale, bless her heart, made a smaller version after a mix-up with fabric amounts. But you have to admit it is too cute for words! That's it for now. I have several things to share over the next few days. Stay tuned. It's been a day of slogging through paperwork. How and why does it accumulate so fast? 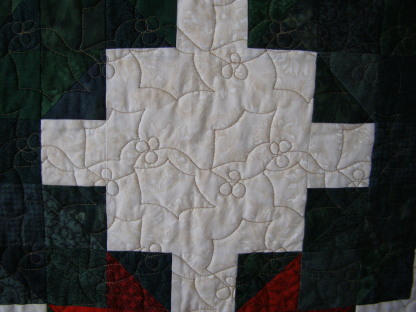 I've also done a bit of hand quilting, but barely enough to claim it. So I thought I'd share two photos I just love. Go ahead, stick your neck out and vote Stroud for President! Debbie and Grace from Watkins Glen have done it again! 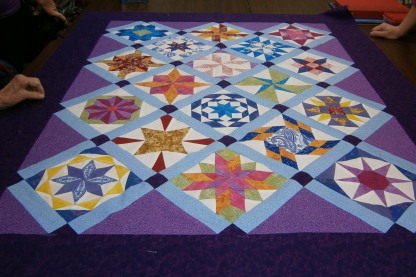 Here is Monthly Bliss 1, their latest completed top. 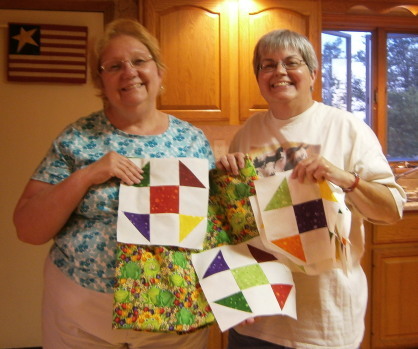 Debbie and Grace work together on most of their quilts. Their color choices are exceptional. The work is meticulous, with sharp points and attention to every detail. Great work, Ladies! I've been hand quilting and horsing around. Plus my muffler decided to be very vocal and I spent yesterday morning getting that fixed. Now I feel like I'm in a stealth bomber it's so quiet! Maybe I'll make Jeep the official Presidential motorcade car! P.S. A shout-out to Sylvia! Hope you are well!